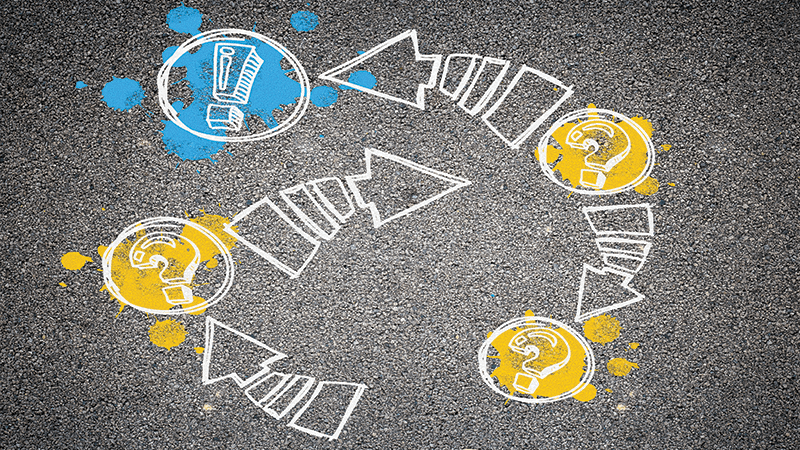 Find out how schools use meaningful data to differentiate. Learn more about Measuring Up’s blended solutions to assess, instruct, and provide differentiated adaptive practice. Andrea Conover, principal of Duanesburg Elementary School in Delanson, NY, remembers when a fourth grade teacher at her school struggled to teach students how to solve a math algorithm. After reviewing state test scores, student report cards, and formative assessment data, this teacher knew he needed to reteach the skill. The question: how? Instead of going wider, he went deeper. After he taught the algorithm one way to the entire class, he narrowed the groups. Then he retaught the algorithm and provided practice until all his students were confident. His hard work paid off; his students showed growth in the next major math assessment. The lesson, says Conover, is that using data to differentiate isn’t about doing everything all the time. On the contrary, it’s about using the data strategically and combining it with strong differentiated instruction practices where you need it. 1. What sources do we use to track student progress? When the teachers at Duanesburg Elementary School sit down to review data, they have a lot from which to choose. There are reports from state assessments, online adaptive tests, standards-based report card information, observations of student reading behaviors, exit tickets, and more. All that information creates a full profile of each class and student. The sweet spot is when there’s just enough data to understand what students know and have learned. Too much data, and it’s overwhelming. Too little, and you won’t be able to make a clear plan. That requires some editing up front. For example, at Duanesburg, Conover sits down with other principals in the district to decide which data sources to put in front of teachers. This year, the focus is on math, which helps narrow the range and amount of data that teachers are reviewing. 2. Do we have relevant and consistent conversations about data? Once you have your data, having a productive conversation with teachers is the next step. The data conversations at Duanesburg Elementary have a rhythm. First, teachers talk about the reports and how to interpret them. They identify areas of strength and talk about what’s going well. Next, they hone in on what needs to improve by looking across data sources to triangulate. In other words, they see what’s similar and different between the various sources they have. For example, if a group of students scores poorly on one particular math standard, what do their report cards and recent exit slips reveal about how they are understanding the concepts? Did the group miss a core concept that needs to be retaught? When the data provides enough information about a student, says Courtney Mix-Binish, principal of Bartolome de las Casas school in Chicago, it becomes easier to narrow in on gaps in learning that can be addressed by the teacher in small-group or one-on-one instruction. Throughout the process, Conover asks teachers open-ended questions. What do you think about this? Or, what do you see in that group? Open-ended questions help teachers drive the conversation. She finds that teachers often come to the same conclusions she has about the strengths, areas of focus, and next steps. 3. Do we use a variety of differentiated instruction strategies based on relevant data? Once teachers have identified the what, or content that needs to be retaught, it’s time to identify the how, or differentiated instruction strategies. The first thing to consider is student grouping. If the entire class hasn’t mastered a concept, Conover’s teachers often start by reviewing exit tickets. Then, as students start mastering the material, teachers think about how to best use small-group time by reworking small groups and pulling in additional support when needed. Once groups are established, the next step is to present content so that it sticks. If some students are missing prerequisite content, then small-group lessons that reteach core skills using explicit instruction may be most effective. On the other hand, if a pacing guide doesn’t provide enough time with a concept, then more practice and opportunities for students to engage may be the next best step. Once a plan is in place, think about how you’ll know the differentiated instruction worked. Will teachers use exit slips, formative assessments, or information from the next round of online assessments? And, that brings you full cycle, back to the data sources that help teachers confidently drive instruction. How does your school measure up? Get your free printable differentiated instruction checklist. 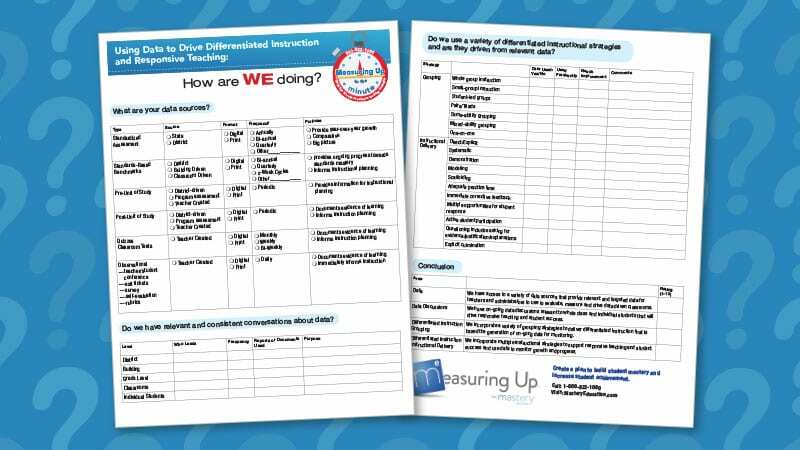 Use it to evaluate and support your school’s use of meaningful data to drive differentiated instruction and responsive teaching. Yes! Please send me news and offers from Mastery Education.